Simon has suggested that a description of a crinoid (mentioned in my recent Benbulben post) could be useful to other walkers who might encounter interesting fossils in the rocks while out and about in our mountains. I’m not a geologist, but mcrtchly is, so I thank him for aiding in this brief description. Crinoids (also known as sea lilies) have been around for about 530 million years, first appearing in the fossil record of ocean sediments deposited during the Cambrian Period. These delicate creatures related to star fish, sea urchins and star dollars, resembled a flower complete with stalk and root-like parts and formed vast colonies on the floors of warm, shallow seas all over the globe during the Paleozoic Era. Some cast off their stalk and root-like anchor to become free-moving. However, many species of crinoids died out in the mass Permian extinctions, but the few that survived include the ancestors of the present day species which tend to inhabit deeper waters. The bodies of crinoids are comprised of calcareous (calcium carbonate) plates. When these creatures die and sink to the sea floor, millions of their bodies compact over time to form thick limestone beds, some of which are eventually uplifted to form new land. As crinoid skeletons are made of calcium carbonate they fossilise easily. 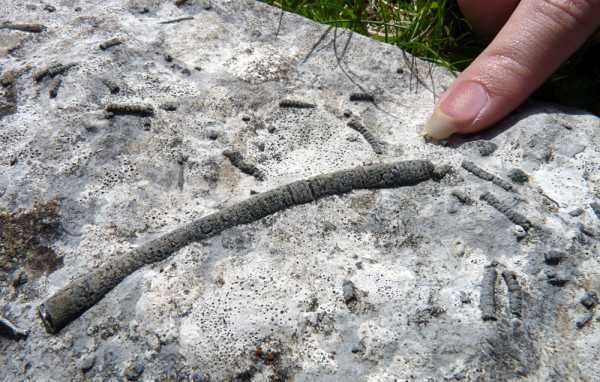 The stalks are the commonest parts to be fossilised and often look like stone worms when seen lengthwise and may protrude slightly from weathered rock. Benbulben Mountain is comprised of rocks formed around 320 million years ago in the Carboniferous Period. The land that became Ireland then lay on the southern edge of a continent called Laurentia that straddled the Equator and was subject to repeated periods of inundation by the Tethys Sea. A hard and resistant rock named Dartry limestone forms the upper cliffs and precipices of Benbulben and lies atop softer shales overlying Glencar limestone. Our fossil find (photographed) was made close to the top of the waterfall on the way up to the Benbulben plateau from Glendarragh Valley and shows fragments of crinoid stalks trapped in Dartry limestone. Benbulben is a good place to look for all sorts of fossils and near the bottom of the waterfall we found a fragment of a giant coral we believe to be Caninophyllum that thrived in the warm Equatorial waters off Laurentia.